Note that the strains in most of Africa are different than in Europe, North and South America. This is consistent with Paul Ewald’s theory that virulent HIV-1 evolved in the bathhouse culture of North America. Also, while subtype C is dominant today in sheer numbers, that has little meaning. What is meaningful here is what it shows about patterns of human sexual interactions. At 2/3rds of the common strain, 5 year time to progression to AIDS (untreated) from Swedish researchers is significantly less than the average 7-8 years, but I wouldn’t call it extraordinary. Time to AIDS of 2 years is extraordinary. But yeah, it’s worth knowing about. 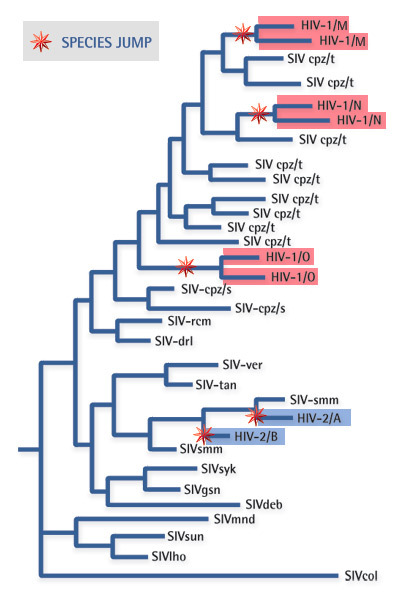 SIV – Simian immunodeficiency virus. 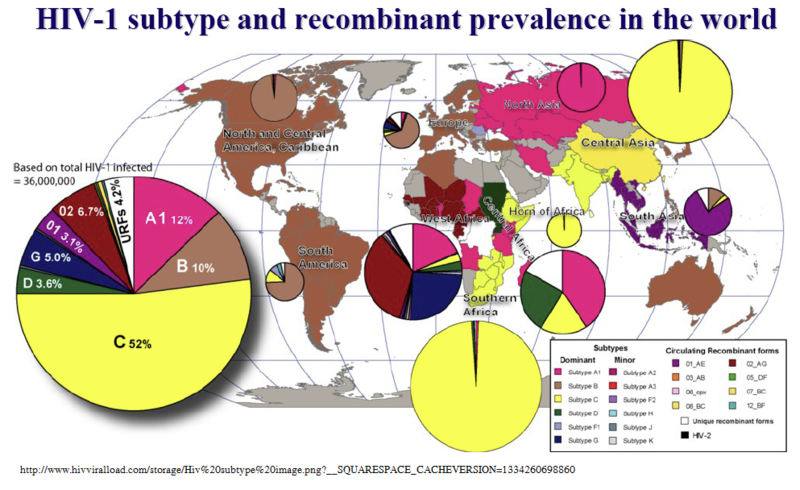 HIV-1 is the most common strain. HIV-2 is a slow progressing strain. Of course, in my experience, too many physicians are reluctant to put HIV patients on HAART early, at least in the USA. I’m not sure why that is, perhaps it’s a carryover from the change in attitudes toward prescription of antibiotics. In the case of antibiotics, not prescribing them for every little sniffle is correct. For HIV/AIDS, it’s not. So patients – shop around. If you have HIV, find a doctor who will be aggressive. But patients, HAART isn’t a picnic in the park, though better than progressing to AIDS – way, way better. Recombination is fundamental to HIV replication. HIV crosses over while reproducing 2-3 times for every copy made. Combined with the very high mutation rate that means virtually every virus is some sort of mutant, this forms the basis for HIV’s evolutionary survival strategy. HIV will evolve to fill any niche it can find. So if there is a population that vectors it from person to person, it will evolve to the maximum virulence that it can and still keep transmitting successfully. I split off the HAART cocktail stuff into a separate post. Posted in HAART, HIV, HIV cocktail, HIV/AIDS and tagged AIDS, cocktail, HAART, HIV, HIV/AIDS.